When you create an Azure Batch pool using the Virtual Machine Configuration, you specify a VM image that provides the operating system for each compute node in the pool. You can create a pool of virtual machines either with a supported Azure Marketplace image, or with a custom image (a VM image you have created and configured yourself). The custom image must be a managed image resource in the same Azure subscription and region as the Batch account. Why use a custom image? When you provide a custom image, you have control over the operating system configuration and the type of operating system and data disks to be used. Your custom image can include applications and reference data that become available on all the Batch pool nodes as soon as they are provisioned. Using a custom image saves time in preparing your pool's compute nodes to run your Batch workload. While you can use an Azure Marketplace image and install software on each compute node after provisioning, using a custom image might be more efficient. Configure the operating system (OS). You can customize the configuration of the image's operating system disk. Pre-install applications. Pre-install applications on the OS disk, which is more efficient and less error-prone than installing applications after provisioning the compute nodes using a start task. Save reboot time on VMs. Application installation typically requires rebooting the VM, which is time-consuming. You can save reboot time by pre-installing applications. Copy very large amounts of data once. Make static data part of the managed custom image by copying it to a managed image's data disks. This only needs to be done once and makes data available to each node of the pool. Choice of disk types. You have the choice of using premium storage for the OS disk and the data disk. Grow pools to large sizes. When you use a managed custom image to create a pool, the pool can grow without requiring you to make copies of image blob VHDs. A managed image resource. To create a pool of virtual machines using a custom image, you need to have or create a managed image resource in the same Azure subscription and region as the Batch account. The image should be created from snapshots of the VM's OS disk and optionally its attached data disks. For more information and steps to prepare a managed image, see the following section. Use a unique custom image for each pool you create. To create a pool with the image using the Batch APIs, specify the resource ID of the image, which is of the form /subscriptions/xxxx-xxxxxx-xxxxx-xxxxxx/resourceGroups/myResourceGroup/providers/Microsoft.Compute/images/myImage. To use the portal, use the name of the image. The managed image resource should exist for the lifetime of the pool to allow scale-up and can be removed after the pool is deleted. Azure Active Directory (AAD) authentication. The Batch client API must use AAD authentication. Azure Batch support for AAD is documented in Authenticate Batch service solutions with Active Directory. In Azure you can prepare a managed image from snapshots of an Azure VM's OS and data disks, from a generalized Azure VM with managed disks, or from a generalized on-premises VHD that you upload. To scale Batch pools reliably with a custom image, we recommend creating a managed image using only the first method: using snapshots of the VM's disks. See the following steps to prepare a VM, take a snapshot, and create an image from the snapshot. 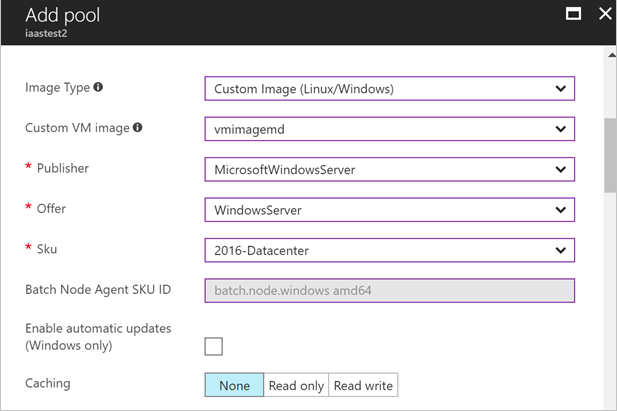 If you are creating a new VM for the image, use an Azure Marketplace image supported by Batch as the base image for your managed image and then customize it. To get a list of Azure Marketplace image references supported by Azure Batch, see the List node agent SKUs operation. You can't use a third-party image that has additional license and purchase terms as your base image. For information about these Marketplace images, see the guidance for Linux or Windows VMs. Ensure that the VM is created with a managed disk. This is the default storage setting when you create a VM. Do not install Azure extensions, such as the Custom Script extension, on the VM. If the image contains a pre-installed extension, Azure may encounter problems when deploying the Batch pool. Ensure that the base OS image you provide uses the default temp drive. The Batch node agent currently expects the default temp drive. Once the VM is running, connect to it via RDP (for Windows) or SSH (for Linux). Install any necessary software or copy desired data. A snapshot is a full, read-only copy of a VHD. To create a snapshot of a VM's OS or data disks, you can use the Azure portal or command-line tools. For steps and options to create a snapshot, see the guidance for Linux or Windows VMs. To create a managed image from a snapshot, use Azure command-line tools such as the az image create command. You can create an image by specifying an OS disk snapshot and optionally one or more data disk snapshots. Once you have saved your custom image and you know its resource ID or name, create a Batch pool from that image. The following steps show you how to create a pool from the Azure portal. If you are creating the pool using one of the Batch APIs, make sure that the identity you use for AAD authentication has permissions to the image resource. See Authenticate Batch service solutions with Active Directory. Navigate to your Batch account in the Azure portal. This account must be in the same subscription and region as the resource group containing the custom image. In the Settings window on the left, select the Pools menu item. In the Pools window, select the Add command. On the Add Pool window, select Custom Image (Linux/Windows) from the Image Type dropdown. From the Custom VM image dropdown, select the image name (short form of the resource ID). Select the correct Publisher/Offer/Sku for your custom image. Specify the remaining required settings, including the Node size, Target dedicated nodes, and Low priority nodes, as well as any desired optional settings. To check whether an existing pool is based on a custom image, see the Operating System property in the resource summary section of the Pool window. If the pool was created from a custom image, it is set to Custom VM Image. All custom images associated with a pool are displayed on the pool's Properties window. If you plan to create a pool with hundreds of VMs or more using a custom image, it is important to follow the preceding guidance to use an image created from a VM snapshot. Size limits - Batch limits the pool size to 2500 dedicated compute nodes, or 1000 low-priority nodes, when you use a custom image. If you use the same image (or multiple images based on the same underlying snapshot) to create multiple pools, the total compute nodes in the pools can't exceed the preceding limits. We don't recommend using an image or its underlying snapshot for more than a single pool. Limits may be reduced if you configure the pool with inbound NAT pools. Resize timeout - If your pool contains a fixed number of nodes (doesn't autoscale), increase the resizeTimeout property of the pool to a value such as 20-30 minutes. If your pool doesn't reach its target size within the timeout period, perform another resize operation. If you plan a pool with more than 300 compute nodes, you might need to resize the pool multiple times to reach the target size. For an in-depth overview of Batch, see Develop large-scale parallel compute solutions with Batch.